Chris Stein, a founding member of the era defining band Blondie, and Blondie lead singer Debbie Harry discuss Stein’s new book of photographs Point of View: Me, New York City, and the Punk Scene. Rob Roth, Blondie’s creative director, moderates. Stein will sign copies of his book following the discussion. During Blondie’s reign at the epicenter of punk’s golden age, Chris Stein kept an unrivaled photographic record of the downtown New York City scene. Point of View is a personal and visually arresting collection of Stein’s photographs which captures an important, but fading chapter in Manhattan’s history. Focusing mainly on a single decade in Stein’s own world, the images presented take us from self-portraits in his run down East Village apartment to candid photographs of pop cultural icons of the time, like Harry, and evocative shots of New York City streetscapes in all their most longed for romance and dereliction. The event is free and open to the public. General public should reserve a space here. Please note seating is on a first come basis; an RSVP does not guarantee admission as we generally overbook to ensure a full house. 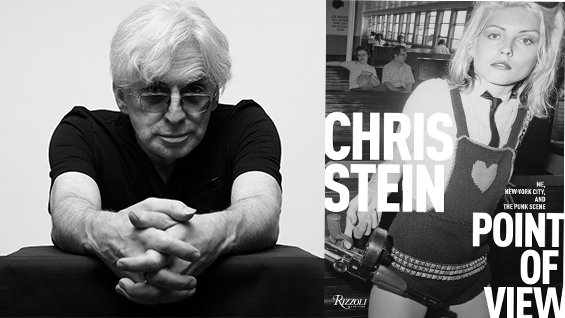 Chris Stein is the co-founder, songwriter, and guitarist of the iconic punk band Blondie. The band’s 11th studio album, Pollinator, was named one of Rolling Stone‘s 20 Best Pop Albums of 2017. Chris’ photographic work has been featured in galleries and press around the world, and published in the successful book Negative: Me, Blondie, and the Advent of Punk (Rizzoli). Beyond his era-defining music with Blondie, he has collaborated with a host of artists over the years, including Andy Warhol, Basquiat, William Burroughs, Devo, Glenn O'Brien, and Shepard Fairey. Rob Roth is a multi-platform artist and director based in New York City who directed the politically charged music video “Doom or Destiny” by Blondie featuring Joan Jett which appeared on several “Best of 2017” lists. Roth works in a variety of media that incorporates theater, film, audio, installation, and technology to create richly textured and poetic work. His multimedia works have been showcased at such venues as the New Museum, PS122, Abrons Art Center, Deitch Projects, and the Whitney Museum of American Art. His audio installation Night Paving: The Aural History of Jackie 60 and Mother (which debuted at the Museum of Arts and Design) premiered as a site-specific ‘silent disco’ on New York’s High Line as part of the public ‘Up Late’ after-hours program, drawing an audience of thousands. He has regularly collaborated with some of New York City’s most progressive performance, music, and theater artists, including Narcissister, Justin Vivian Bond, Julie Tolentino, Big Art Group, Vangeline Theater, Amber Martin, and Edgar Oliver. His unique dark vision has served him well in some of the more commercial projects he’s taken on as well, for such artists as Rihanna, Lady Gaga, Blondie, and David Bowie.